It has occurred to me that this will probably take a year or longer to parse out. So, I have shortened the name and will focus on one or two shows per post. I will shoot for one post per week, and more when I can swing it. I have shortened the name to (It’s) GRIM-which stands for Gender Representation in the Media. It is fitting because so far the results are grim, indeed. DJ stands for Disney Junior. 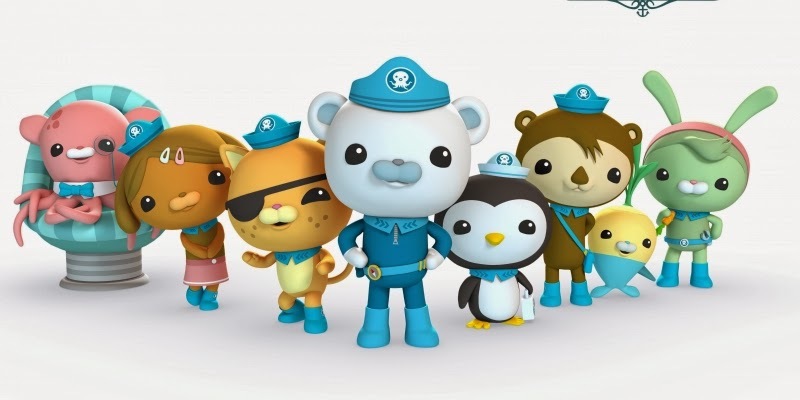 So, today I will look at The Octonauts. As you might guess from the character placement in the picture, the girls are periphery characters. It is very disappointing that the female characters get so little screen time, because this show is pure adventure-running, swimming, rescuing animals, fleeing from other animals. It would be great if little girls could see women doing this. Today, I watched The Octonauts and the Amazon Adventure. It takes 4 minutes to hear a girl speak, and when she does, she says, “I’m on it Captain.” In other words, she is following orders. There is nothing wrong with following orders, but it stuck out to me because of what the male characters do up to that point. The scene opens with Kwazzi (the adorable boy cat lead character)looking for and finding a treasure map! It leads to a treasure in the Amazon River! And he has to fend off sharks to get to it!!! And the entire crew goes on an adventure to find the treasure, based on his finding!! And he gets to drive the submarine!! And Dashi (the female dachshund who runs the ships computers and is the official photographer) gets to take orders from the ship’s captain. It is feeling a little imbalanced. Her next line doesn’t happen until we are in the Amazon River, when she says, “Parrots! Manatees!” (Cuz girls love the cute animals). She also gets some pointless lines, like “Look! !” when directing the men to look at the tree that fell on the sub. Thanks honey, never would have figured that out. There are two female guest characters in this episode. Bertha is a dolphin who is helpful and has lines and unique skills. Of course, she is pink, but there is a pink dolphin that lives in the Amazon, so it is a correct interpretation. There is a female eel who gets to be mean, which is kind of cool. An electric eel should be mean. But it is obvious that her meanness comes from a place of fear, unlike the sharks, alligator, or anacondas; who are just mean because they are. She is also pink. And once Peso (the penguin doctor) fixes her tail, she is nice. After her tail is fixed, the eel just leaves, she doesn’t do anything helpful for the guys to repay them. Although she does comes back in the final fight scene, her role is minimal, she is just one of the group of fighters. Dashy finds a fish that is out of water, and tells the men, who do most of the rescue. Dashy does some of the pushing. Dashy’s camera is stuck on a high tree branch, and she can’t reach it (because apparently there aren’t any long sticks lying about in the rain forest??) After the fish returns to the water, he jumps out of the water up to the branch, and gets her camera. So, she rescues him, but he rescues something for her back. After she gets her camera back, Dashy is going to take his picture. He jumps out of the water and poses for the camera mid-jump, restoring masculinity. In another example of female helplessness, Tweak goes to get help, because even though she is in an aquatic vehicle, she is uable to move the branch that is pinning the submarine. The branch is underwater, by the way. She brings a (male) catfish, who eats the branch away. Yay! Fish saves the day! Most of the adventure belongs to the men. 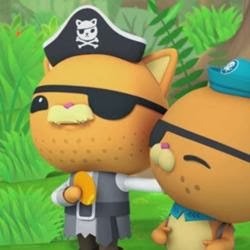 Kwazzi meets up with his grandfather, a pirate who has been missing for years. The two of them have a great, heroic adventure. In case you think I am over-the-top in my assessment, I would like to point out that in the very first episode, Dashy is a damsel-in-distress, photographer who is not observant or intelligent enough to notice that she is actually inside a whale shark. Luckily the smart male characters notice the teeth and tongue, and they warn her. She is not able to get out in time, and the men have to go and rescue her. This one is a disappointment, especially since the head writer is a woman. The books on which the series is based are written by a woman and a man. 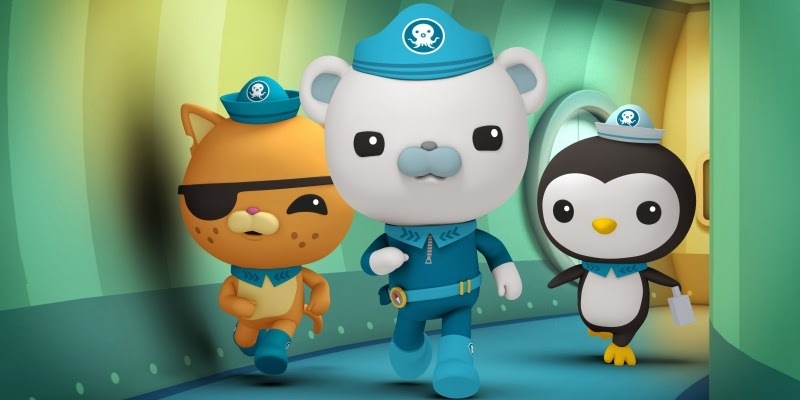 The Octonauts inhabit a dude world. The show has very cool adventures and a good learning component, but the male characters are the ones who enjoy the most screen time, adventure, and heroism.